All bluebirds are considered to be cavity-nesting birds. This means these birds prefer a cavity in a hollowed-out tree for making their nests. Land development has caused a loss of this natural habitat for the bluebird. 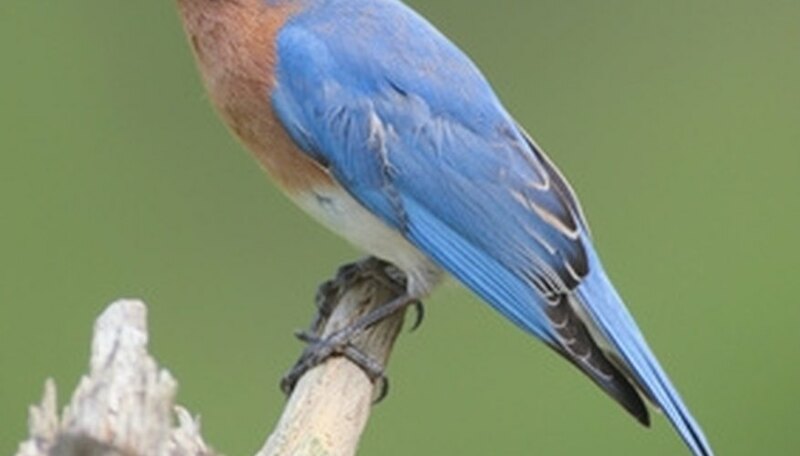 As a result, the bluebird population decreased significantly from 1900 to 1975. Bluebird nesting boxes have contributed to the upswing in the bluebird population in recent years. 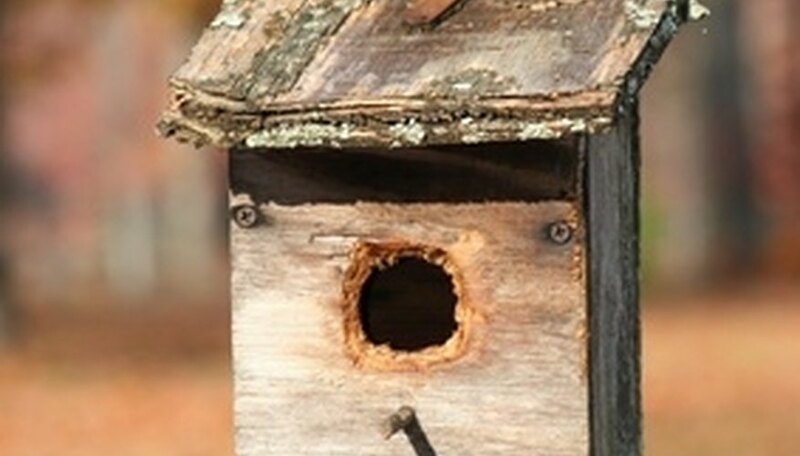 Nature lovers everywhere can help this bird thrive by providing a nesting box which closely replicates their natural choice for nesting and raising their young. Select a bluebird house which is suitable for bluebird nesting. The ideal nesting house will have an entry hole that is 1 1/2 inches in diameter. The bottom of this hole should be drilled 5 to 6 inches from the floor of the house. The distance from the top of the hole to the roof should be around 1 1/2 inches. The roof of the bluebird house should overlap the sides by 2 to 3 inches. The floor of the bluebird house should ideally be 4 inches wide and 4 inches long. Drill 1/4 inch holes, using a drill and 1/4-inch drill bit, on the bottom of your bluebird nesting box to allow for water drainage. Space the holes evenly along the bottom, keeping them at least 1 to 2 inches apart. Attach a hinge to one of the sides so that you will be open to open the box for cleaning. Remove the perch from the outside of the box if there is one. Scout for a good location to place your bluebird house. Choose a location in an open field, golf course, or large open lawn space. Do not place in an area where insecticides or pesticides are being used. Avoid areas where starlings and house sparrows are nesting if possible. Choose an area at least 50 feet from your house. Dig a hole approximately 8 feet deep and 10 inches wide with a shovel. Place two feet of a metal fence post or bluebird house pole into the hole. Fill the hole in with dirt. Tamp the ground in firmly around the base of the pole to secure it into the ground. Place subsequent poles 100 to 150 yards apart. Attach the bluebird house to the metal pole with pipe clamps. Slide the bluebird house onto the pole if you are using a bluebird house pole. Make sure the opening of the nesting box is facing the south or southeast. Tug gently at the house to make sure it is secured tightly. Make sure the top of the bluebird house is 5 to 6 feet off the ground. Attract bluebirds to your nesting boxes by providing suet cakes near the boxes. Hang the suet cake in a cage suspended from a tree limb. Choose a bottom-feeding cage if starlings are present, as this type of feeder is undesirable to this bird. Refill suet cages often, especially during the spring. Bluebird nesting houses should ideally be set up in February to attract spring hatchlings. An overhead wire or fence near the nesting box will help attract bluebirds. Do not attach your nesting boxes to a tree as predators can easily get to the bluebirds. Misty Amber Brighton has been writing for over 10 years. Her writing has appeared on various websites. She is a veteran of the United States Armed Forces and attends South University. When Do You Plant Lilac Bushes: In the Fall or Spring? How do I Make a Birdhouse Out of a Milk Jug?